Blueberries, Art and Life: Painting a Mural and Gardening = A Busy Summer! 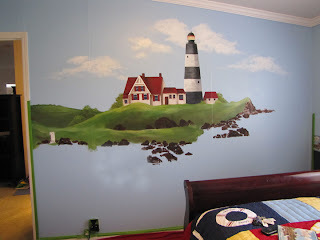 Painting a Mural and Gardening = A Busy Summer! No, I haven't fallen off the face of the earth! Summer is a super busy time around here.....taking care of blueberries, tomatoes, peas, okra and lots of flowers. In the meantime I've managed to work in a mural for my grandson, Tyler. 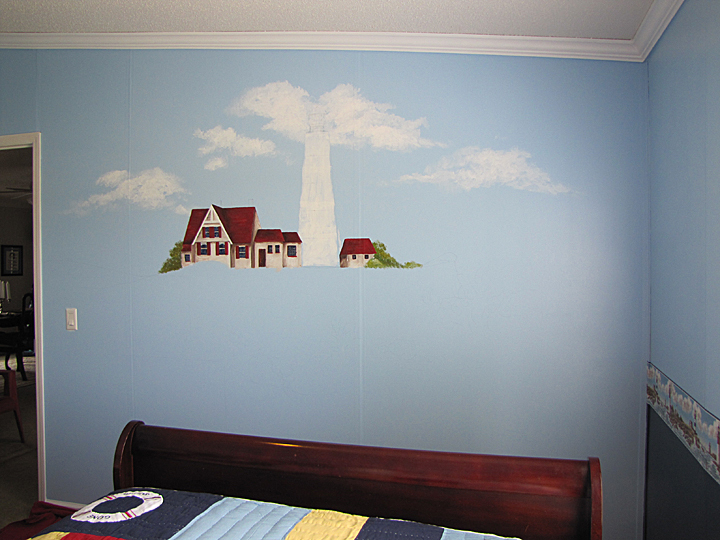 He requested a lighthouse scene to match the border of his newly redecorated room. The mural measures about 10 ft wide and 7 ft. high. I'm posting photos showing the progression. The second photo from the top shows the happy "customer" (Tyler is in the middle) with two of his cousins. 2. 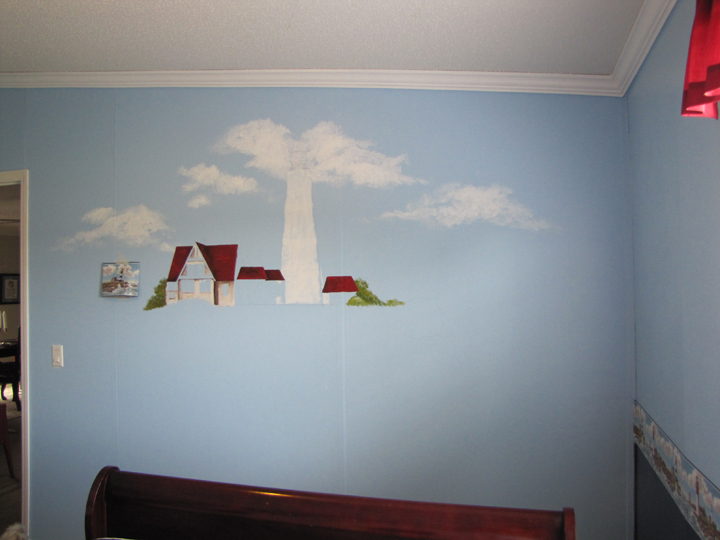 I usually work from the upper left down, making sure that the main features are where they need to be. 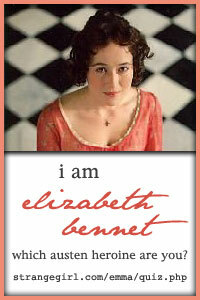 So sorry I haven't been able to visit lately and see what's going on with your blog... I'll be back as soon as I can to see all the lovely things you're making in your corner of the world! My word - you have been busy. 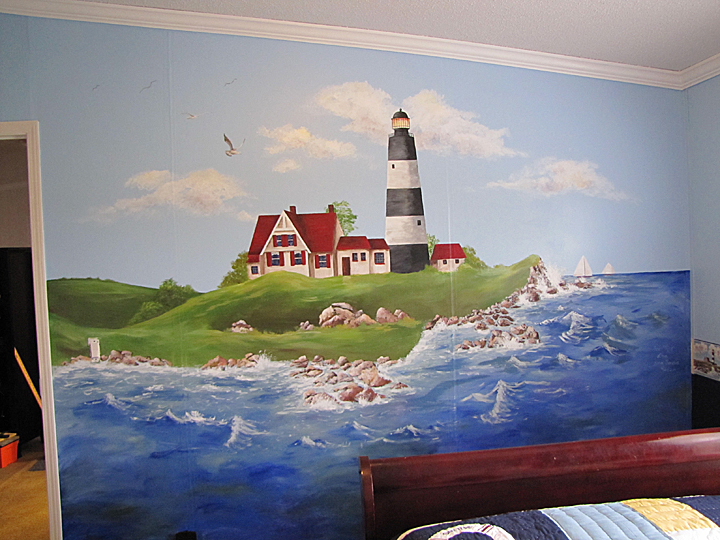 What a fantabulous mural - your Grandson is one very lucky little chap. Our blueberries are now ripening fast - pie-making comes next! Une oeuvre gigantesque et titanesque ... je suis certaine que Tyler doit être fier de vous et va dès lors inviter beaucoup de camarades pour leur montrer sa chambre! je vous félicite, car je sais que ce n'est pas une petite affaire pour avoir effectué pour la jetée du port de la ville de Sainte-Maxime une fresque de 50m2. BRAVO! un très beau travail dans le mouvement de l'eau. Gros bisous et dites à Tyler que je veux bien aller dormir dans sa chambre... on doit y faire de beaux rêves! Excellent! You did such an incredible job and should be very proud of your hard work. Thank you for sharing! This is fabulous!! I'm so envious of your grandson having this in his room. I have a real interest in lighthouses so this really got my attention. Looks great! and thanks for sharing about how you did it and the photos along the way. Teresa, that mural is fantastic. I especially like the movement in the waves. Beautifully done! Hi T, missed interacting with you! I knew that you were silently up to something as splendid as this one! Nothing is more pleasurable than to make your grand kid happy! Beautiful piece you created for your lucky customer! WOW WOW Oh my this is so awesome. No wonder you have been so busy. I am speechless and just have to keep looking at this wonder WIP. Well done Teresa. lot of hard work and love here. Oh My! What wonderful gift for your grandchild! We can see in the photo how proud he is :) Great job! Thanks also for the w-i-p pics. Absolutely beautiful, Teresa! 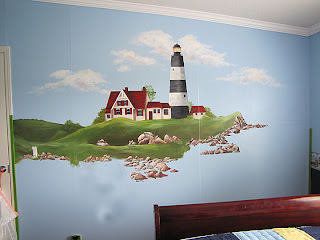 Aren't murals fun? You did a fantastic job! Super job, Teresa! I know your grandson is thrilled! Very nice Teresa! I like seeing how you went about it. 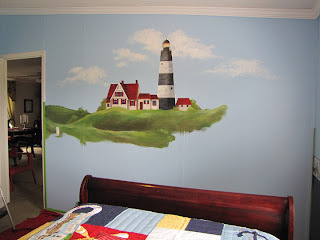 I've never painted a mural. 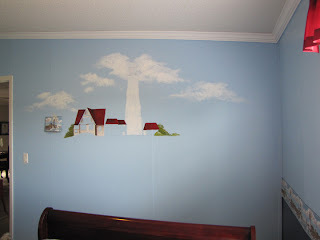 You did a great job with it and also with filling in your space. You have some pretty happy looking fellows. I bet they'll enjoy being at the beach! Wowzers!!! This is awesomely beautiful. Major undertaking for sure. How wonderful, what an amazing achievement, I am sure Tyler will love it. The quilt is gorgeous too. Thanks so much for the offer of help with Indesign.At the moment I am keeping going with the help of my book and my son who visits now and again. Oh..my goodness, Teresa!! I LOVE IT!! I will definitely NOT show this to my grandchildren! they'll have me on a ladder tomorrow! absolutely Awesome...GREAT JOB. What a fantastic grandmum he has. I like the quilt too. Wow, the mural looks fantastic! It is so adventurous. I think it is always nice when one can share their art with the loved ones, especially if those loved ones are relatives. Excellent work. 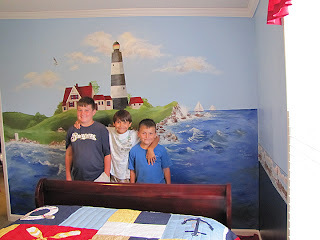 We hope you fared well during Irene. I think of you, just don't get by here. Hope your health is good, too. Beautiful work! 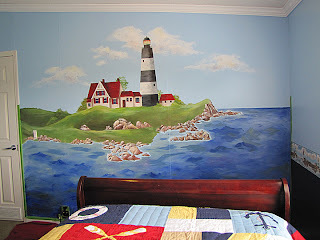 I painted a mural...several actually, in my sons room of a sea monster, pirate ship, light house, dolphins swimming. That was eleven years ago. For the last seven years, he has had the walls covered with posters! LOL. I hope yours sees the light of day for much longer!